WHILE I WRAP MY MIND AROUND BEING RETIRED, I'M JUST GOING TO ENJOY ALL THE FOODS OUT THERE TO BE COOKED, TO BE SHARED AND TO BE PICTURED – SO I'LL NOT FORGET THE GOOD ONES! 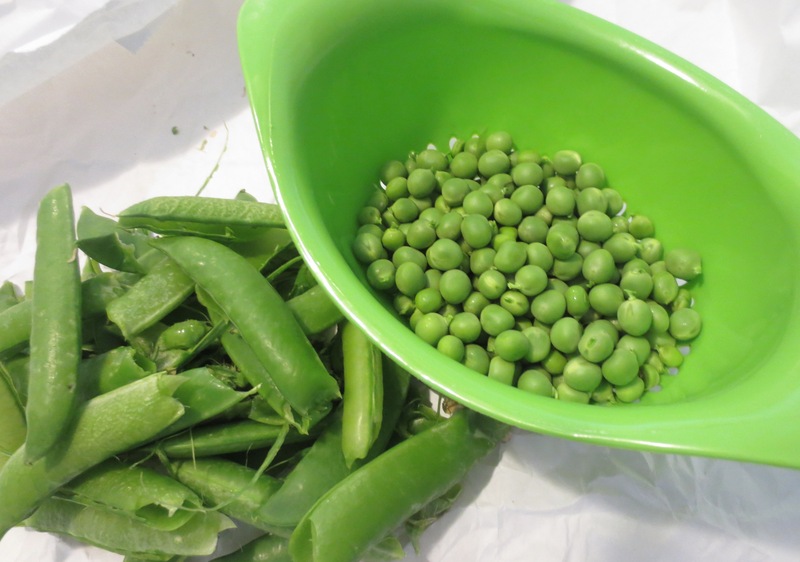 Last blog entry I shared the recipe using our gift of fresh peas – Saffron Couscous with Fresh Peas and Chives, which is an excellent recipe. What I didn’t pay attention to was the amount of couscous called for…..1 1/4 cups. This I know is way too much for just a couple of servings for the two of us. Adapted from a recipe from Giada DeLaurentis from Food Network. In a medium bowl, mix together the couscous, cilantro, egg, egg yolk, coriander, lemon zest, salt and pepper. Sprinkle the flour over the mixture. Mix until combined. In a large nonstick skillet, heat the oil over medium heat. Form 1/4 cupfuls of the mixture into 8 patties. Add 4 of the patties to the pan and cook for 3 to 4 minutes each side until golden. Drain on paper towels. Repeat with the remaining couscous mixture. 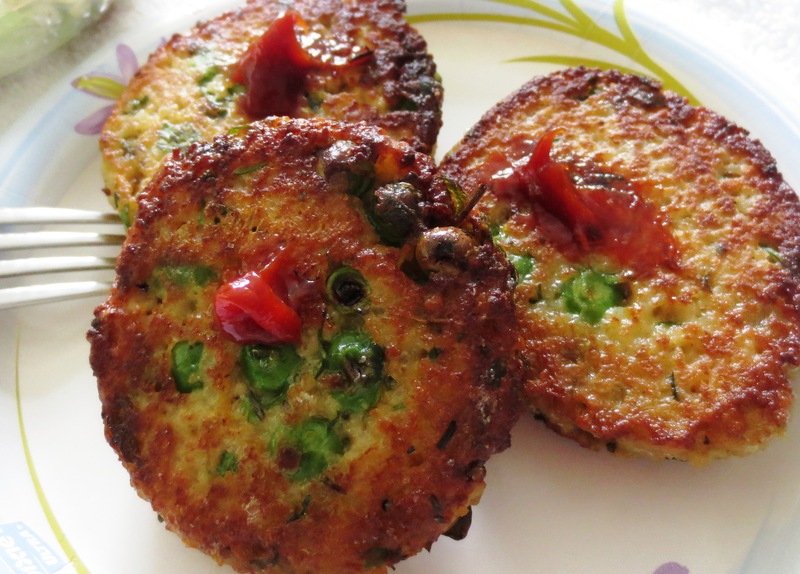 Serve with chutney or just about any sauce you like. After 1 dinner and a batch of cakes, I still had 4 cups of couscous leftover. 2 cups are now saved in the freezer. Now comes the dish of the week! A little background which will bring us up to today’s Seafood Couscous with Coconut Curry ‘gravy’. Yesterday we went to a friend’s house for a paella dinner. My friend, Gary, makes a mean Paella and he has a new paella pan which, of course, he had to show off! I must say I’d almost kill for one of these pans – it is humungous and absolutely beautiful -check the size of the wine glass to the size of the pan to see why I’m so envious…. 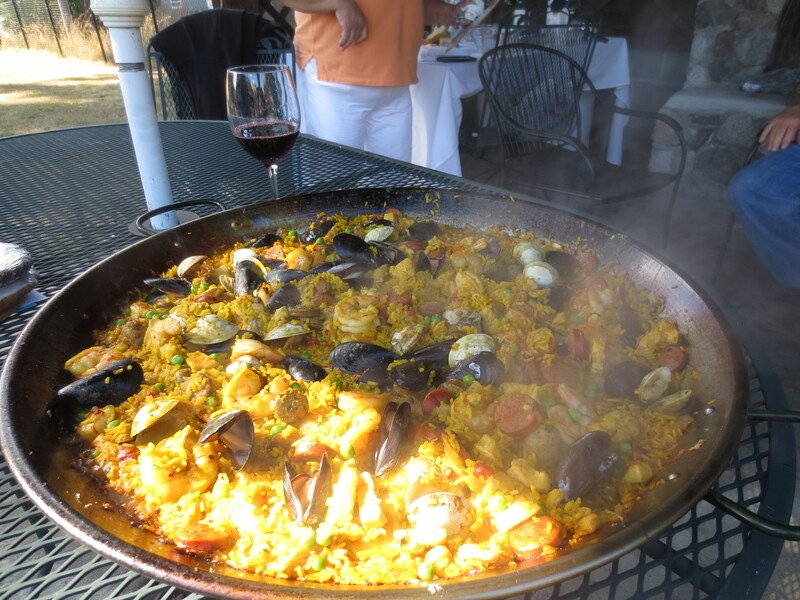 And, because of the size of pan, the amount of paella was humungous, also. LEFTOVERS for the guests!! 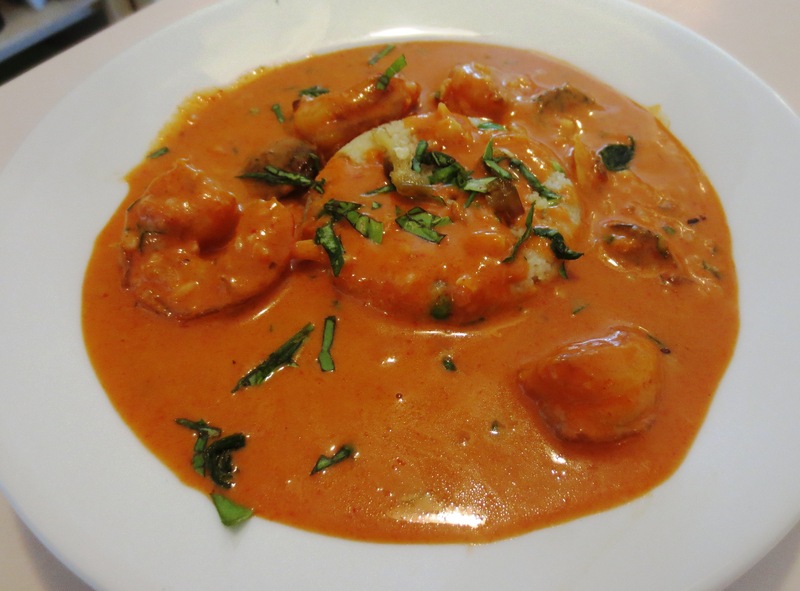 Now, for the 2nd backup story (I hope you’re still with me) – a week or so ago we went to our favorite local Asian restaurant, SoHo Asian Bistro and had the best Seafood with Coconut Curry I’ve ever had! Naturally I wanted to recreate the dish if possible and with the leftover bounty of seafood and couscous, everything just fell into place. This recipe is from Thai Kitchen website and while it is very good, it was not a duplicate of the dish I wanted….so the hunt is still on. But, I will make this one again, it’s delicious so I will share it. MIX coconut milk and red curry paste in small saucepan. Bring to simmer on low heat, stirring constantly. STIR in chicken stock, fish sauce, peanuts, sugar, salt, kaffir lime leaves and cornstarch mixture. Bring to simmer. Stirring constantly, simmer until mixture begins to thicken slightly. Remove from heat. STIR in basil and chiles, if desired. Today is Saturday June 20th and tomorrow is Father’s day – I’m sure we all have the menus worked out for our favorite guys……don’t we? I’ll keep mine under wraps until tomorrow after we’ve judged them. 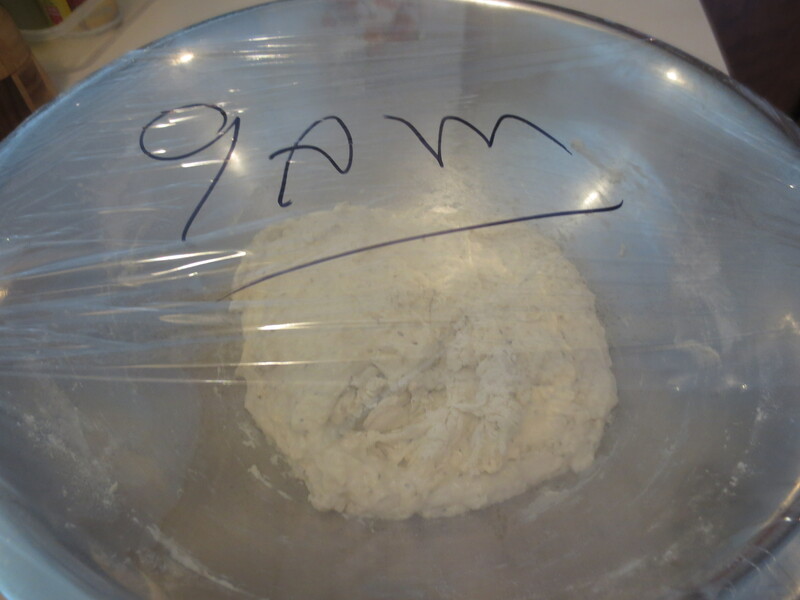 But, I will say I do have a loaf of 18 hour bread working on the counter….one of Roy’s favorite things in the world! 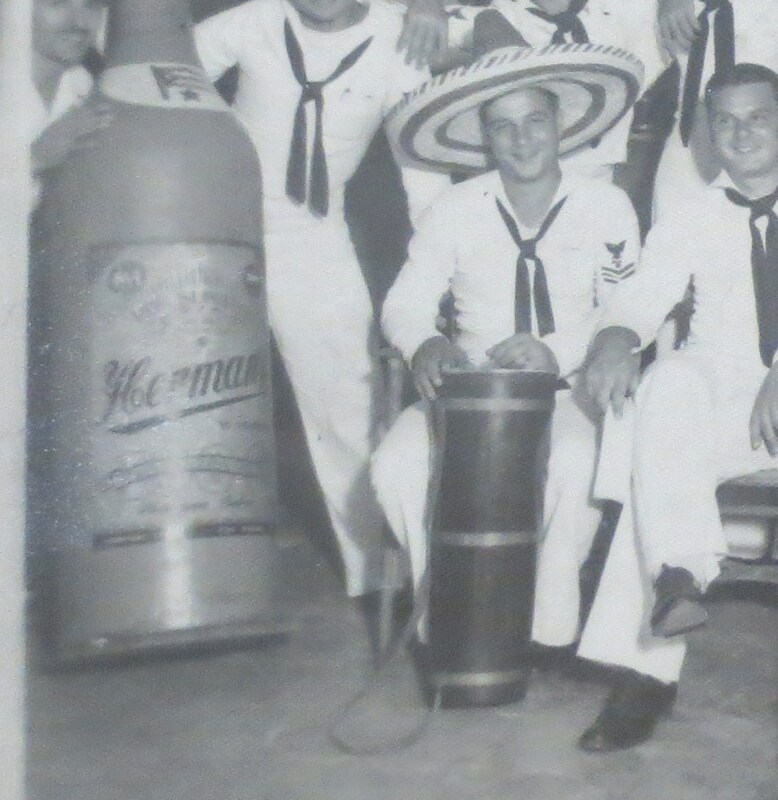 More tomorrow and I want to wish all our fathers the happiest of days – to the Dad’s still with us and those who are not that we will never forget!! 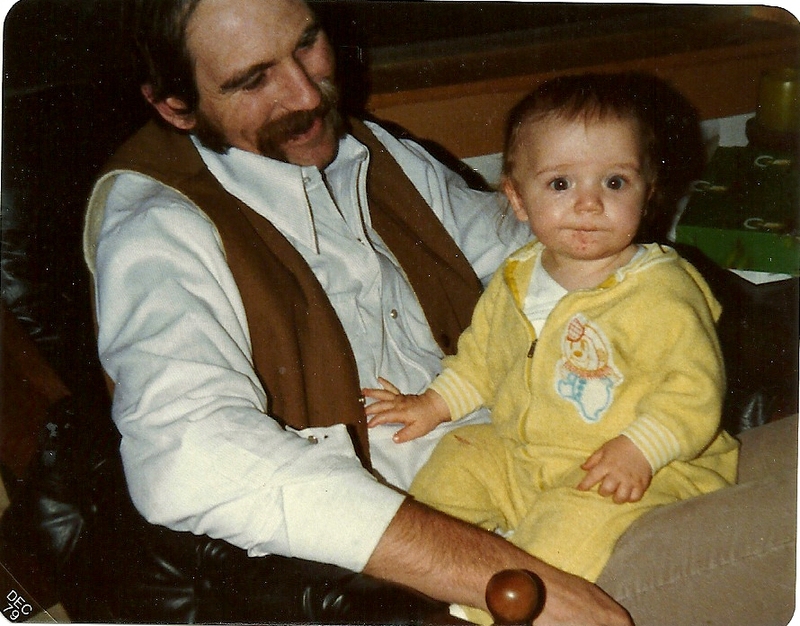 Here are two of my favorite Dads – and we lost both of them too darn young….more about them tomorrow. Best Salmon Patty – So Far!